Women bangles hold a very important place in the Indian traditions, especially in the lives of married women. These bangles are not just a piece of ornament but they hold a specific significance in Indian cultures and traditions. Sikh culture is known for its rich traditions and joyful events. They are the happy go lucky type of people who love enjoy themselves and their weddings. From dhol to their brides, everything is up to the mark where you can’t get off your eyes and hearts off them. 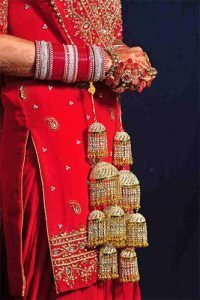 Choora is basically the cultural symbolic for Sikh brides but nowadays the whole nation is opting this style wholeheartedly. For a Sikh bride, her choora is an important part of her look. Gold has always been the best material for ornaments when it comes for a bride. Especially when it comes to Malayali brides, they prefer to wear a lot of gold on their wedding day. They love gold and it is totally visible in their attire, including bangles. Their bangles are not any different. 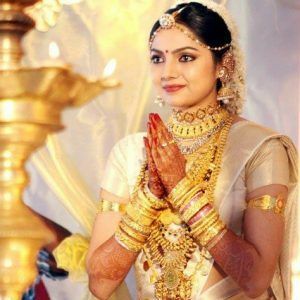 All Malayali brides wear beautiful gold kadaason their wedding day. The set of their bangles include thin and thick size of different gold bangles and you can’t get enough of it. You can choose their kind of online jewellery and have the perfect bridal look. 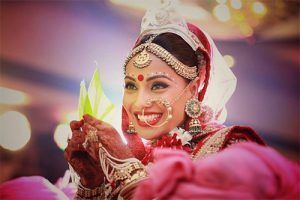 Bengali matrimonial are steeped in rich culture and traditions with every ritual performed with great composure. The brides generally wear the dark red coloured sari on their wedding day. The set of white and red bangles made by shell and coral which is also called sakha paula has major significance in their culture. Without these sakha paula no Bengali wedding is considered to be complete. It is considered that these bangles shouldn’t break within the first year of marriage as it counts as bad omen for married life of the bride. The state Rajasthan is known for its women bangles. They make the best bangles, specifically laakh which is also worn by their brides on wedding day. They make the combination of colourful bangles having leheriya work and make the set of bangles. 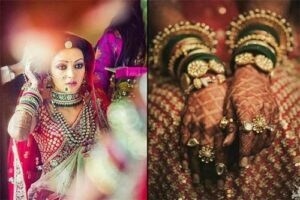 Rajasthani weddings are known for their grand and royal weddings with lots of culture and traditions. Their brides look the best with old ethnic jewellery and borla on their forehead. With all those heavy rajasthani lehenga and jewellery, their brides look alike the old royal queens. A maharastrian bride considers the most beautiful bride with all beautiful maharashtraian style saree and beautiful nath. A Maharashtrian bride wears green bangles in uneven numbers. Pairing the green bangles with gold kadaas consider as good luck for the marriage. The intricate designing on the gold kadaas gives the green bangles a very ethnic look. 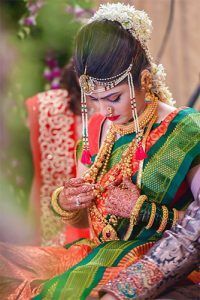 The maharashtrian brides look the best and stylish brides because of the jewellery and style of saree. Choosing maharashtrian online jewellery would be the best choice for other girls as well. Enjoy the wedding look with your cultural bangles.